The city’s favourite watering hole, The United Sports Bar & Grill, has planned a Father’s Day Special Drunch for all you amazing people who want to take their fathers out for a meal they’re unlikely to forget. Pick from the Beer Drunch and the IMFL Drunch, both extremely loaded and exciting! 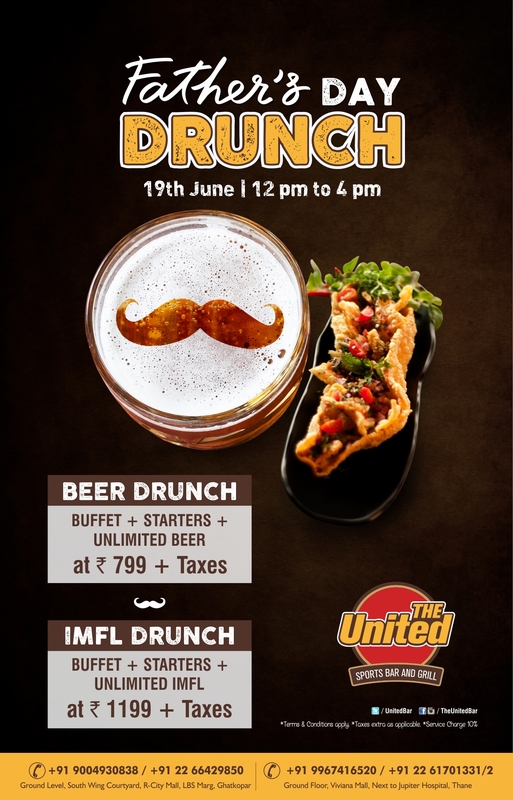 The Beer Drunch is an extravagant buffet spread that comes with starters and unlimited beer at just Rs. 799 + Taxes! The IMFL Drunch comprises a generous buffet, starters and unlimited IMFL at just Rs. 1199 + Taxes! If this is not the deal of the season, nothing else is! You can walk in with your father at The United on June 19 between 12 – 4 PM to participate in this amazing celebration of the most special man in your life.